I suspect that unless you have elected to ride the rollercoaster that is supporting a minor football team, you have not really understood what it is to be a football fan. How do I begin to describe to a Manchester United or Arsenal fan the pain of relegation, or the devastation that follows as all of the club’s best (and probably your favourite) players get sold or leave the club for greener pastures? Truthfully, a Wayne Rooney or a Frank Lampard are relatively easily replaced for a big club. Losing Wilfried Zaha so that he can sit on the Manchester United bench is an entirely different story for a Palace fan. As a fan living on the other end of the planet, there is the additional pain of not having your team’s games televised, and having to follow them in newspapers (or at least that was the case until the internet on mobile phones made following them that much easier) . Following a small club is like having an unfaithful spouse: you can’t help but love them, but you frequently resent them, despair over them, moan about them to your friends, but can never bring yourself to entirely disown them. 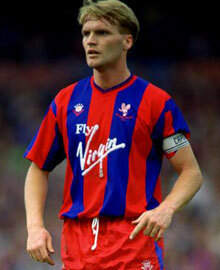 I fell in love with Crystal Palace at the dawn of the ’90s. As with women, sometimes we fall in love with football clubs for quite random reasons. During Apartheid, local games were not as accessible on television as the English games were. Had I been born post-Apartheid, my first love may well have been a more accessible and possibly more rewarding local club. As fate had it, a Palace game was being televised that day. I don’t remember who Palace demolished that day, but Geoff Thomas was imperious in midfield, John Salako was mercurial on the left wing, Eddie McGoldrick on the right wing was simply poetry in motion, and the lethal duet of Mark Bright and Ian Wright was intoxicating. I think, too, that in my growing awareness of the political injustices in my country, I liked the fact that so many of the players were black. I lost my heart. The rot began. When they toured our country – I don’t remember the year – my father (I will never know how he pulled it off) managed to get me onto the bus with them as they traveled into Soweto for one of their training sessions. I was so overwhelmed, being in the presence of my heroes, that I barely spoke a word to them. I loved listening to them imitate my accent, and was even asked by a reporter, when we alighted from the bus, if I was one of the players. How I longed to say yes. In later years, Geoff Thomas would become my favourite, not only for his non nonsense style of play, but for his selflessness in doing charity work for cancer victims. I got him to sign my autograph book twice. As the years went by they broke my heart often, yo-yoing between divisions, always playing passionate football, but not always playing pretty football. But by that time it was too late. I had fallen in love and could not abandon them. I had to learn to take something else out of football. Truthfully, there are times for any football fan when you hate your team and you have to find something else beautiful in the game to give purpose to your watching it. 1) True freedom necessitates boundaries. I think that in life we always want to be able to do waht we want, and we see the imposition of any form of rules as repressive and undesirable. Anyone who has complained about the referee making a dubious decision that cost their team the game (the decision to send Dikgacoi off against Manchester United last season, or the penalty that the referee awarded Tottenham, when the ball inadvertantly struck the arm of Dean Moxey, spring to mind for me) will understand that the best games are the ones where the referee is fair in enforcing the rules. A lawless, chaotic game is no fun for anybody. Somebody has to set the rules in life. We don’t have to like them, but ultimately life works better when we accept and abide by them. For me, those rules are the ones set by God. If He is the creator of life, we are likely to derive the most fulfilment from it when we abide by the rules He sets. In life, as in soccer, if you can make your limited opportunities count – make each touch, no matter how insigificant it may seem, flawless – you increase your likelihood of success. We get more opportunities in life than we like to think. Most of our success in life comes through people. Make every contact with another person count. You never know what may come of it later. Treat people with respect. When talking to people, make them your only priority for that short time. These small things have a habit of rewarding you later. And when the big opportunities come, the focus and sincerity that you have developed into a habit with the small opportunities will give you better odds at success than if you had been careless. Carelessness is a habit, and a damaging one. 3) Be aware of your fans, and honour them. Every club would close down if their fans abandoned them for long enough. Every person has power in some sphere of life. It may be in your family, among your friends, in your workplace, even financial power. How you exercise that power will influence the support you get from others. If you let your fans down too often, eventually they leave. the key to keeping your fans is moral integrity. Live what you preach. keep the gap between what you do and say as small as possible, and the fans will keep coming. 4) Know your goal and how you plan to get there. You don’t just walk onto the pitch, kick the ball around and hope for the best. You study your opposition and your own strengths, and you tailor a strategy that maximises your own player’s strengths while diminishing any advantage the opposition may gain from theirs. So why do we approach life – which is infinitely more important – differently? we often have plans about what we want to achieve. We seldom have plans for who we want to be. If you picture your funeral, and what you want people to say about you, I can guarantee that more often than not the things you hope they will say are character and not achievement related. What legacy do you want to leave for those who you love the most? That’s your goal. How ill you get there? Remember that who we are is the product of all the small actions we perform every day, not of the once-off ostentatious ones. You will be remembered as generous, for example, not if you make an enormous contribution to charity once in your life, but rather if you give of your time and energy and resources in little bits to those who need it every day. Don’t underestimate the power of small actions. 5) No player is bigger than their club. No player is bigger than the game. You will find life fulfilling only when you realise that it is not only about you. When you serve the club, like Sir Alex Ferguson, or Ryan Giggs, rather than your own pocket or ego, you find true greatness. Greatness and happiness should never be goals in themselves. That is to chase the wind. These things only last when they are by-products of a more selfless pursuit. In closing, I don’t always know why I stick by Palace. Maybe it says something about my twisted psychology that I do. But I have learnt to love the game for something more enduring than results. I have a love-hate relationship with my team. Palace will always have a part of my heart. Football will always have all of it. there is wisdom and beauty in the game we would be foolish to ignore.